The government’s outstanding debt surged P768 billion or 11.4 percent to P7.494 trillion as of end-January from P6.726 trillion a year ago, data from the Bureau of Treasury show. Construction of the Philippines first underground railway system commenced last Wednesday (Feb 27) with Department of Transportation (DOTr) Secretary Arthur Tugade and representatives from the Japan International Cooperation Agency (JICA) conducting an official ground breaking ceremony. Filipinos can expect more imported rice to enter the country as the law liberalizing the local rice industry takes effect today. IF the government can encourage greater competition in the services sectors, the economy could see an addition of at least 0.2 percentage points to GDP growth annually, according to a World Bank study. THE DEPARTMENT of Transportation (DoTr) said it expects to make significant progress in securing official development assistance (ODA) from China for the Mindanao Railway Project this month. MANILA, Philippines — The number ofmeasles cases reported nationwide has climbed to 16,349 with 261 people dying after contracting the disease, as of March 2, the Department of Health (DOH) said Monday. Philippine President Rodrigo Duterte on Monday appointed his budget secretary as the governor of the Bangko Sentral ng Pilipinas. The Philippines’ largest shipyard, which collapsed in January with $1.3 billion in debt, has attracted interest from Dutch and U.S. shipbuilders, amid political opposition to a Chinese takeover. The Subic Bay Metropolitan Authority has released its revenue shares to neighboring local government units, this time in the amount of P222.13 million for the second semester 2018 dividends. The government of Indonesia plans to help in the rebuilding a grand mosque in Marawi City which was destroyed by a five-month war in 2017, Indonesia Vice President Jasuf Kalla said. Iloilo Governor Arthur Defensor, Sr. is urging the Sangguniang Panlalawigan (SP) to set aside politics and prioritize the welfare of Ilonggos by passing the 2019 PHP3.7-billion executive budget. The National Housing Authority (NHA) on Monday provided financial aid worth PHP5 million for the victims of Typhoon Rosita in two towns of Mountain Province. MEMBERS of the Senate Committee on Economic Affairs are poised to grill ranking Duterte administration officials on March 5 on the “status, sustainability and risks” of multibillion-peso projects lined up under Malacañang’s massive “Build, Build, Build” (BBB) program, as well as the preferred mode of financing to bankroll the Palace-backed projects. More than 230 rebels and supporters of the New People’s Army recently returned to the fold of law because of localized peace talks, according to the Department of Interior and Local Government (DILG). The Philippines has landed in eight place among the top 10 countries with low gender gap or, according to the World Economic Forum, the top 10 best countries to be a woman. 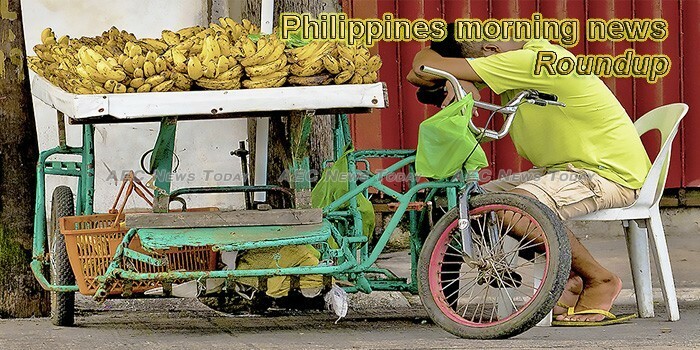 REMOVING restrictive regulations and unequal and discretionary application of policies could improve productivity and add at least 0.2 percentage points to the Philippines’ gross domestic product annually, a World Bank economist said on Monday. CUSTOMS agents announced they foiled an attempt to smuggle into the country about 1,500 live tortoises on Saturday night. Activists on Monday protested outside the Chinese embassy over reports of its boats chasing away Filipino fishermen from a string of sandbars close to a Philippine-occupied island in the South China Sea. PRESIDENT Rodrigo R. Duterte has signed into law a measure that requires the government to automatically enroll all persons with disabilities (PWDs) into the National Health Insurance Program. The threat posed by local terrorist group Abu Sayyaf is driving away investors, President Rodrigo Duterte said, as he warned that the Philippines would not rise if it fails to address its security issues. FILIPINO workers are better off than their Southeast Asian counterparts in terms of work-life balance, online career and recruitment firm Monster Philippines reported. THE Technical Education and Skills Development Authority (Tesda) on Monday announced the promulgation of 20 new and amended training regulations (TRs) in Automotive, Construction, Information and Communication Technology (ICT), and Tourism to strengthen industry-academe linkages to address any skills-job mismatches in critical sectors. Malacañang is standing by its decision to allow the release of the names of candidates allegedly involved in illegal drugs despite criticism it would violate the right to be presumed innocent. The banana market is an important market in China, where the annual production volume of bananas is huge. The Libyan High Court has acquitted 7 Filipino seafarers earlier sentenced to 4 years in prison on fuel smuggling charges, the Department of Foreign Affairs (DFA) said Monday. Malnutrition is widespread across the Philippines. There has been little progress in addressing undernutrition, and overnutrition has emerged as a serious concern. Iloilo City received some PHP14.27 million worth of sports equipment donated by the Philippine Sports Commission (PSC) following its successful hosting of the Visayas qualifying leg of the 2019 Batang Pinoy games. Housewives, the stay-at-home mothers who work all day raising their children and taking care of their husbands, or women who are out of the labor force and are commonly considered “unproductive” should now be compensated for their contribution to society, according to a bill filed in the House of Representatives. The Philippine National Police (PNP) on Monday said it considers asking the Professional Regulation Commission (PRC) to revoke the licenses of members of the Alliance of Concerned Teachers (ACT) which is allegedly linked to communist rebels. Straight to hell – that’s where the senatorial candidates of the opposition Otso Diretso (Straight Eight) are headed, according to President Duterte. The Department of Labor and Employment (DOLE) has scaled back the deployment of skilled Filipino workers to foreign countries after it noticed the dwindling number of laborers in the country. The Department of Energy (DOE) expects stable power supply during the summer months despite the El Niño phenomenon, with additional capacities planned to be injected during the period. The Intellectual Property Office of the Philippines (IPOPHL) reported Monday that applications for intellectual property protection significantly increased in 2018. Lawyer Joe Sayas Jr., who has rendered more than a quarter of a century of service championing the cause of the working class, was recently awarded the 2018 Presidential Awards in Malacaang for 25 “outstanding” overseas Filipinos and foreign-based organizations. Over 300 Filipino nurses and caregivers are needed in Japan, the Philippine Overseas Employment Administration announced yesterday. The members of the 18 fisherfolk associations received gill nets from the local government unit (LGU) of Surigao del Norte through the Provincial Agriculture Office which aims to improve the fishery sector in the locality. Local Government Undersecretary Martin Dio revealed to this writer the activation of more than 44,000 barangay antidrug abuse councils (Badac) nationwide in fighting criminality and drugs. The Alliance of Concerned Teachers (ACT) on Monday asked the Court of Appeals (CA) to rule on their petition against the Philippine National Police (PNP) for it alleged “profiling” of their members based on the merits and not on technicalities. DepEd Southern Leyte Division, in close coordination with the Southern Leyte Dental Society extends free dental health care services in celebration of the National Oral Health Care Month serving indigent school children in selected municipalities in the province. Philip Morris International (PMI), the owner of Marlboro brands, is heating up its multibillion dollar program to end the tobacco smoke by introducing better alternatives to cigarettes consumed by Filipino smokers. The Department of Environment and Natural Resources (DENR) and San Miguel Corporation (SMC) on Monday signed a deal to fund the project that aims to clean up one of the filthiest rivers in the country.